» What Tactical Formation Did Spain Use to Win Euro 2012? The starting position phase formation is approximately a 4-2-3-1; the attacking phase is 4-2-1-3 or 3-3-1-3; and the defending phase is a 4-4-1-1, so we have four formations coming from one; depending on where the ball is and who has it. Fabragas played as the (9) in this diagram but rotated with Iniesta; Xavi and Silva; (11), (10) and (7) respectfully here. Here we show how Alba (3) and Arbeloa (2) attack high up the field. Iniesta (11) and Silva (7) tuck in to take the Italian defenders inside to create space outside for the fullbacks. If they are not followed by defenders then this created a BIG overload of players centrally for Spain to exploit. 1. Where (6) passes to will depend on how the opponent defenders react to these combination movements but with the left footer on the right and right footer on the left plus the fullbacks the team has two great options, one coming inside to attack the space inside and possibly shoot with his strongest foot; and one overlapping with width to get a good cross in, again with his strongest foot. Here you see how Spain exploited the width of the field against Italy’s narrow midfield with both fullbacks attacking throughout the game, Alba in particular showed the value of this with a great forward run that resulted in him scoring the second goal. As shown above; the 4-2-3-1 is a flexible way to play employing four units rather than the usual three. It can transform quickly into a more offensive pattern of play of 4-2-1-3 by moving forward the wide outside midfielders and with this push on the two fullbacks to fill the spaces they have left. 5. Attacking midfielder (10) (Xavi) plays between the opponent’s defense and midfield. He can interchange with the wide players or the striker (9). 7. The two defensive midfielders can interchange. 1. Here are some potential movements in front of the passer (8). All very simple but may cause CHAOS in the opponents defense. Spain know what they are doing in advance of the ball, the opponents do not; and this is to the teams advantage. 1. Four potential options for (3) in front of the ball. Cannot at this moment in the development of the session play a straight pass to (10) but there are four other options of a forward pass. This becomes a 6 man attack including the fullbacks (2) and (3); who may underlap and switch with (7) and (11) also as shown above. Another aspect of their play was THIRD MAN RUNS. Alba for the second goal showed this with his late and fast run. Many runs were made like this diagram above to get in behind the Italian defense. Spain’s movement OFF THE BALL is a joy to watch. The only players who you could say stay in their positions are the keeper and the center backs (4) and (5) the rest of the team seems to have great freedom to express themselves all over the field but at the same time so well coordinated that they cover for each other as this happens. 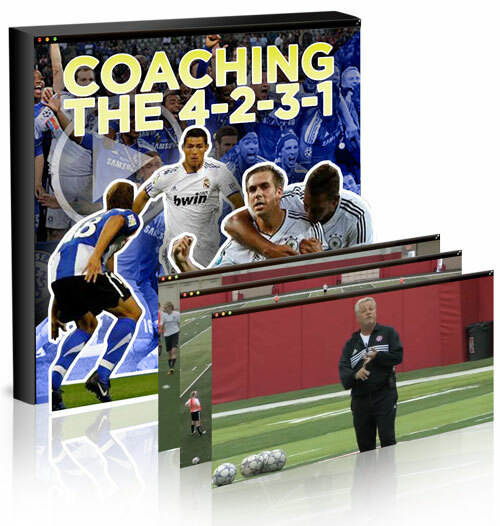 The movements in attack of the Spanish team epitomizes what can be seen in my 12-part video series – Coaching the 4-2-3-1, which you can check out here.